Wound spray containing gentocin violet and having topical antimicrobial and antifungal properties. Curity Practical Cotton Roll, non-sterile. Size: 12-1/2" x 56". We prefer this Kendall due to ease of use, some products are very tight in the center and do not unroll well. For all cuts, wounds, burns and skin irritations on horses, livestock and small animals. Helps eliminate and prevents proud flesh and extensive scarring with minimal loss of hair. Tolerated well most of the time, some horses with fresh wound will show a slight sting on application the first few days. Made of 100% pure cotton with a fine 24 x 17 mesh, roll is 6 inch wide X 5 yards long. 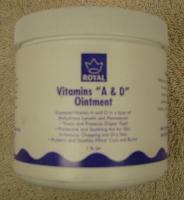 Vitamin A & Vitamin D Original Ointment:Helps treat and prevent diaper rash. Protects chafed skin or minor skin irritation associated with diaper rash and helps seal out wetness. This human ointment works great on minor wounds and abrassions on animals as well.